My first thought when I found out I was pregnant (after “OMG OMG OMG OMG”) was how much fun I’d have showing her movies, seeing her reactions to them, and getting to experience my favorites movies again with fresh eyes. I figured I wouldn’t get to start this until she was three or four, but she has developed an incredible love for The Many Adventures of Winnie the Pooh (that’s the 1977 Disney film which is itself a compilation of three previously released shorts), and we watch it just about every day. 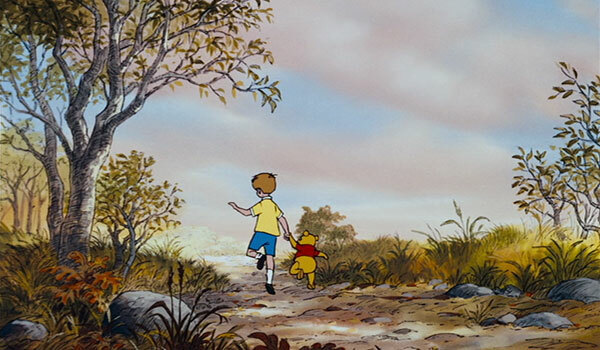 Thankfully, I also love Winnie the Pooh, but I’ve also found myself making a ton of random observations throughout the many viewings to keep myself sane. Here are some of those observations. 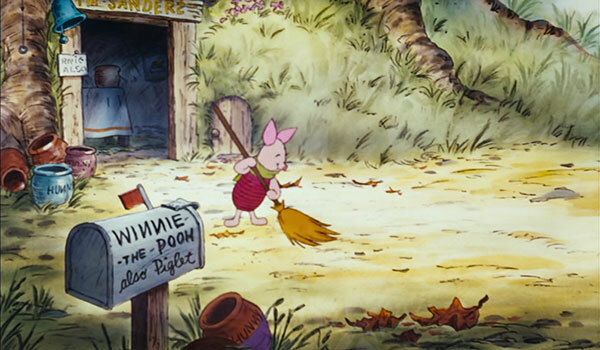 The Piglet in the opening looks way different than the Piglet in the actual film. 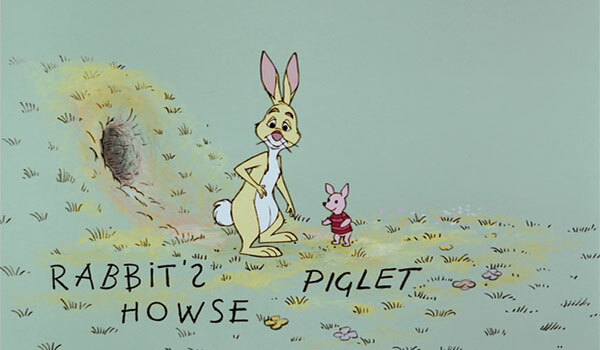 Piglet isn’t actually in the first section at all; he’s replaced by the made-up speech-impaired gopher for some reason (“I’m not in the book”). 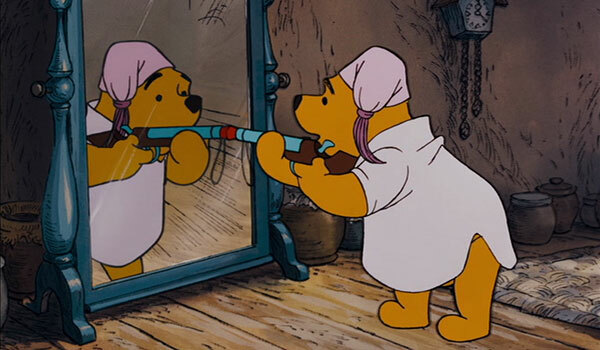 They did include Piglet in the second short, which was originally released a few years later. They apparently didn’t update the Piglet in the opening to match the Piglet they ultimately used in the second two shorts. 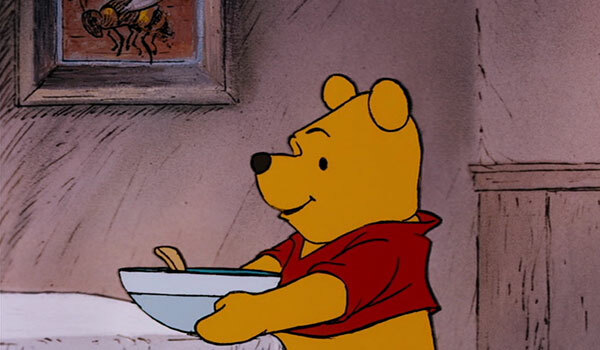 Pooh gets out a bowl and spoon in preparation for his meal. 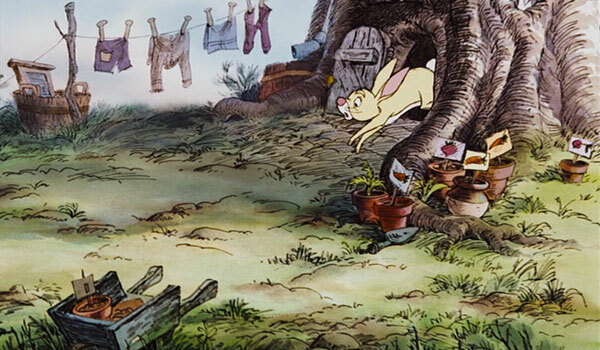 Yet throughout the whole film, he always eats honey directly out of the pot (or the tree). “The only reason for being a bee is to make honey, and the only reason for making honey is so I can eat it!” Irrefutable logic. 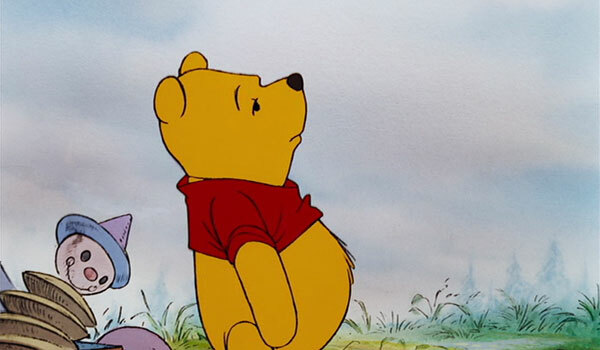 I love the “duh” look on Pooh’s face when he answers Christopher Robin’s concerns over a) whether you get honey with a balloon and b) what his disguise is supposed to be. 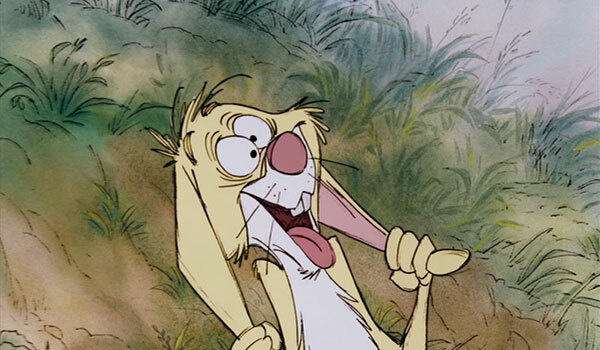 Sterling Holloway’s voice work is perfect, too. 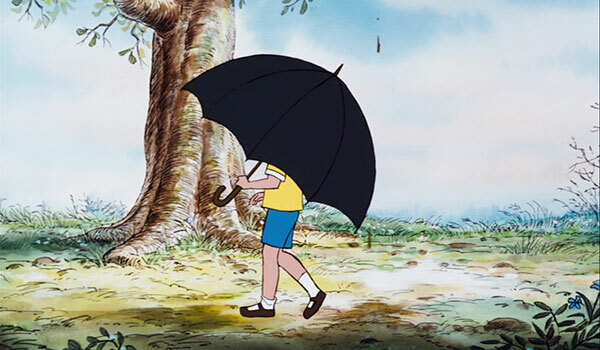 “Tut tut, it looks like rain!” Christopher Robin is very supportive of his stuffed animals’ eccentricities. Rabbit is the only one who has fingers. All the others just have mitten-like paws. 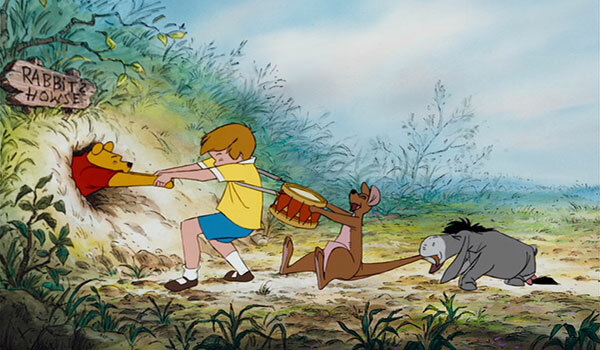 I mean, except for Christopher Robin of course. 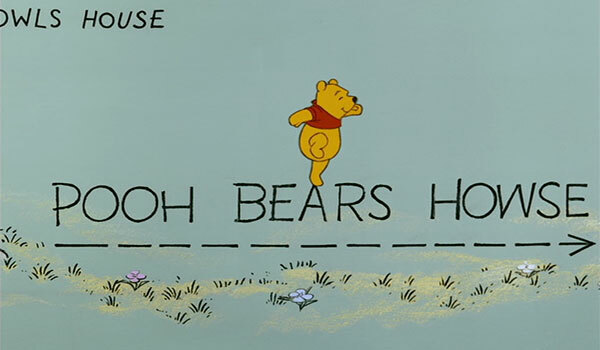 Pooh clearly needs an intervention. 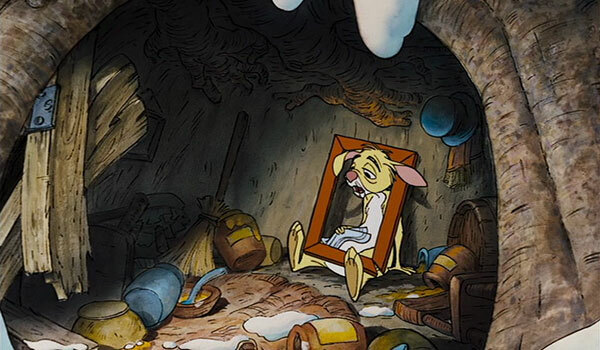 It looks like Pooh could’ve easily fit through Rabbit’s OTHER door. It’s much bigger. 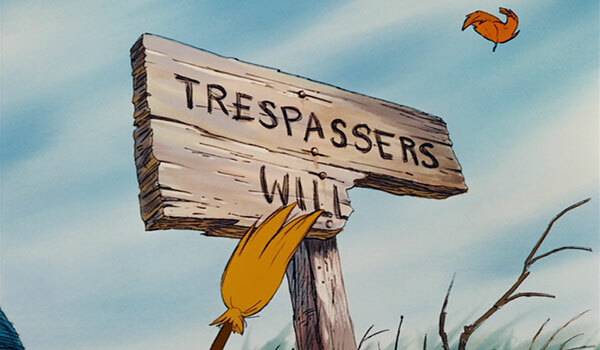 Piglet says his house has been in his family for generations, but that’s obviously a “Trespassers Will Be Prosecuted” sign. Presumably Christopher Robin in real life has seen a broken sign like that in the woods and has created this backstory for Piglet to use it. 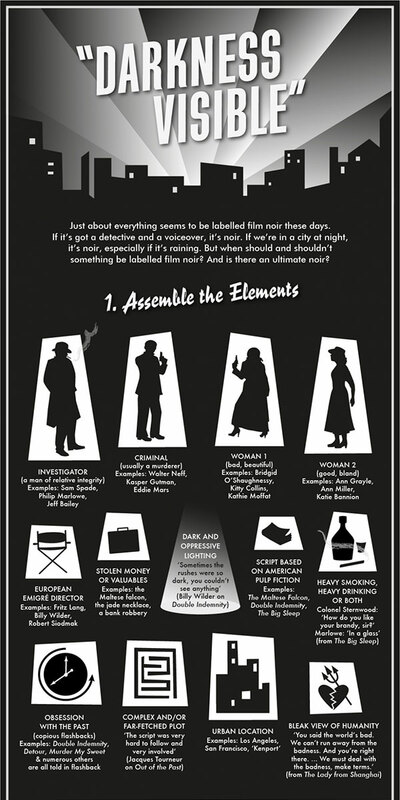 A lot of the make-believe stuff in this film is explicit – I like that this one is a bit more subtle. Tigger’s all excited about being the only one of his kind, but, I mean, they’re ALL the only one. 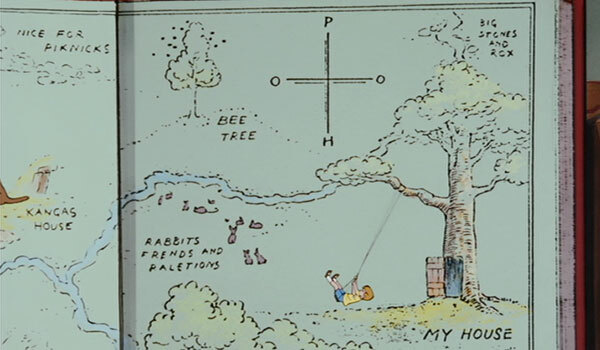 Except possibly Rabbit, whose “friends and relations” have a special section on the Hundred Acre Wood map. 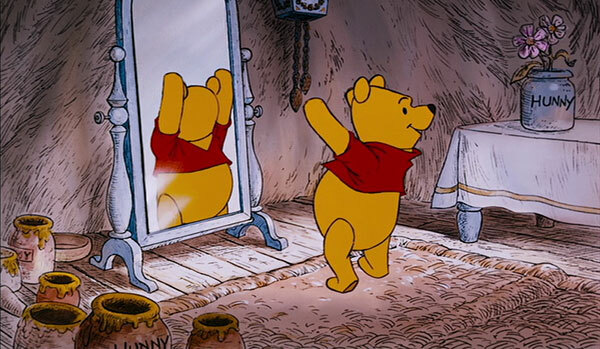 I suppose Pooh thinks he’s not the only one because he doesn’t understand about mirrors. 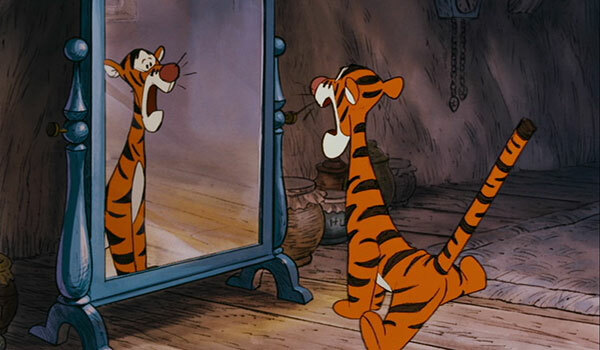 Tigger also doesn’t understand about mirrors, but since he suffers from short-term memory loss he forgets the other Tigger instantly. 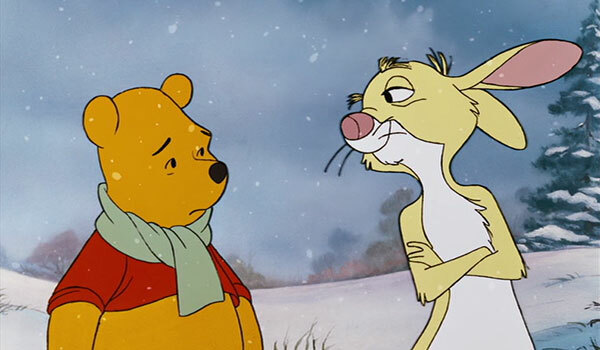 Apparently Pooh is also especially forgettable, since in the third section, Tigger knows everyone else perfectly but has to be reminded that he already knows Pooh. 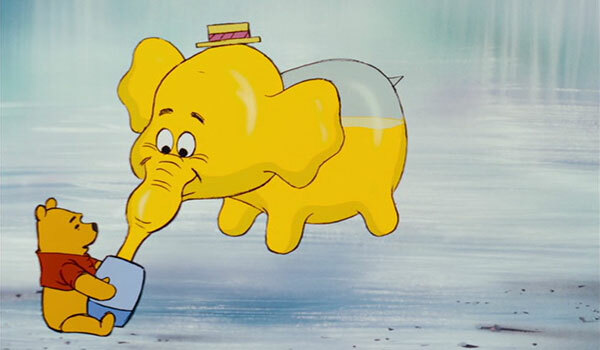 Those Heffalumps and Woozles are pretty cruel. 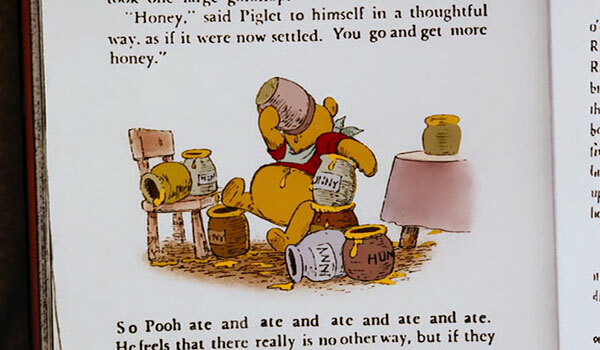 They don’t care about honey at all – they only theoretically want to take it because Pooh likes it. 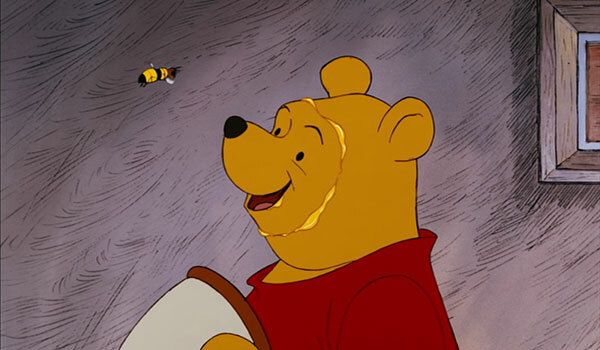 “If honey’s what you covet, you’ll find that they love it, because they guzzle the things you prize.” If Pooh had prized something else, they would’ve wanted THAT. Greedy bastards. 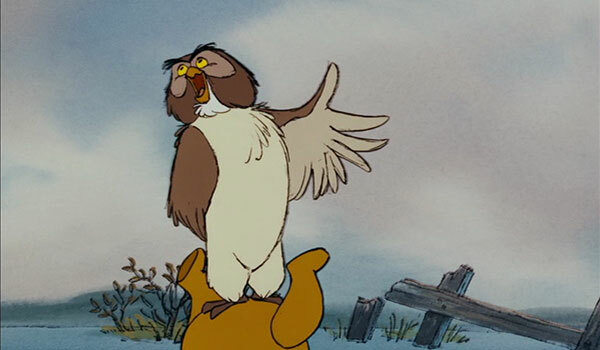 Christopher Robin sent Owl to go to Piglet’s house during the storm to check on him – doesn’t that suggest that Owl knows perfectly well where Piglet’s house is and thus should recognize it when Eeyore takes him there? 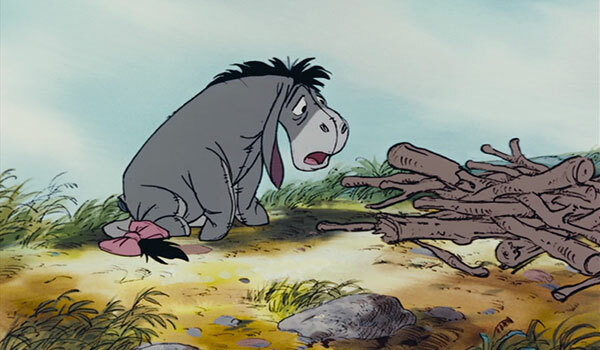 Eeyore apparently hasn’t been to Piglet’s house either, despite how long it’s been in Piglet’s family, which suggests that Eeyore (and possibly Owl) really isn’t in the core friend group. Maybe that’s why he’s so depressed all the time. I did not expect them to actually give Piglet’s house to Owl. But apparently it was a permanent solution, because in the third section, Pooh’s mailbox says “Winnie the Pooh, also Piglet”. Rabbit is a real party-pooper. And kind of a jerk. 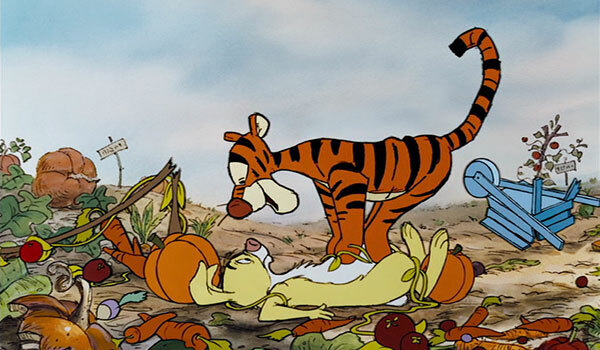 Even aside from being inhospitable (to be fair, Pooh does pretty much devastate Rabbit’s honey supply), he’s incredibly proud of his plan to turn Tigger into a “humbled Tigger, a small and sad Tigger” by leaving him lost in the woods overnight. What kind of friend wants their friends to be small and sad, or lost in the woods all night, or later in the film, stuck at the top of a tree FOREVER, or never able to do the thing they do best? “Why, oh why, oh why does it always happen to me?” KARMA. That’s why. 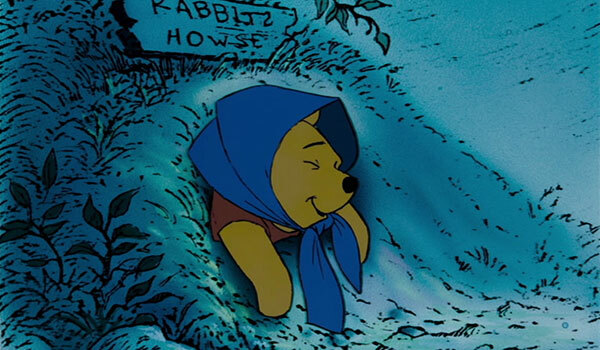 Jonathan has advanced the theory that Rabbit is an introvert stuck in a group of extroverts who just wants to be left alone but can’t manage to avoid having his home invaded by hungry bears, his honey stolen by same, his home egress blocked by same, his person repeatedly bounced by enthusiastic Tiggers, etc. In which case, here’s the lesson – all you extroverts out there, give your introverts space! Otherwise they might become raging sociopaths who plot to lose you in the woods, leave you at the tops of trees, and take away the one thing that brings you joy. 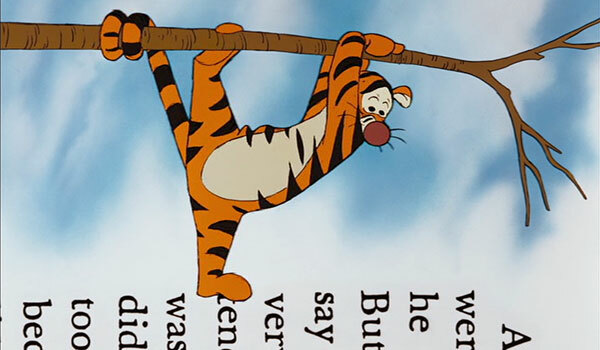 Tigger really doesn’t even need to stop bouncing – he just needs to stop bouncing ON PEOPLE. Seems like an obvious compromise that would solve everyone’s issues. 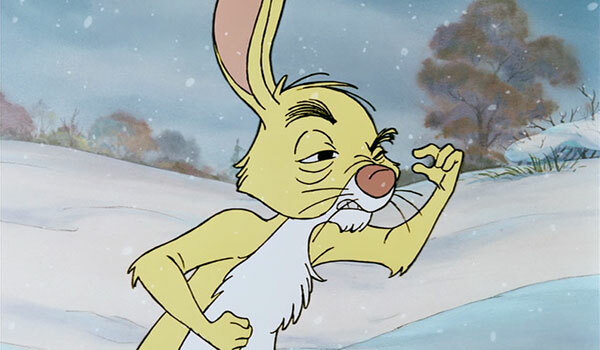 There is an arc for Rabbit, though – one of the only characters who does have an arc. 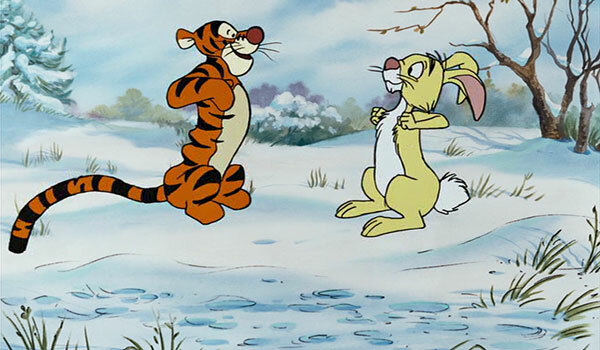 After all his douchiness to Tigger, as soon as Tigger offers to bring him into the group and shows him he has a fun-loving side, Rabbit bounces along happily, maybe a little less jerky than he was before. Tigger thinks he likes everything best. But he’s only right about bouncing. At least he’s willing to try anything once! Except jumping down from trees. This narrator is almost a precursor of the narrator in Into the Woods in terms of textual self-awareness, except all the characters take him for granted. 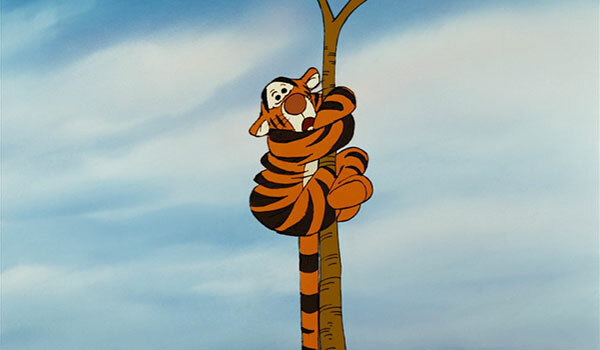 Except Tigger, who suddenly becomes narrator-aware as his life is flashing before his eyes up in the tree. Even Tigger knows he’s in a book, though. He probably knew about the narrator too, but just forgot. The explicit textuality is one of my favorite things about the film (and about the 2011 Winnie the Pooh movie as well). The end makes me think of the Toy Story movies, with the focus on the toys as the boy grows up and starts going to school. 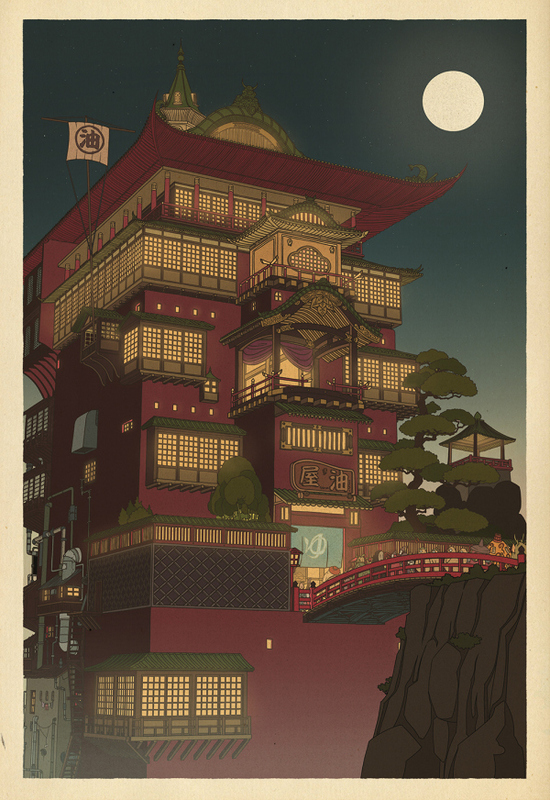 That particular storyline touches me greatly in both cases. Yeah, I was maybe a little too hard on Rabbit. And you could read the end of his arc as smoothing over his very real issues with the way certain other members of the group treat him by bringing him into their way of thinking rather than acknowledging his. 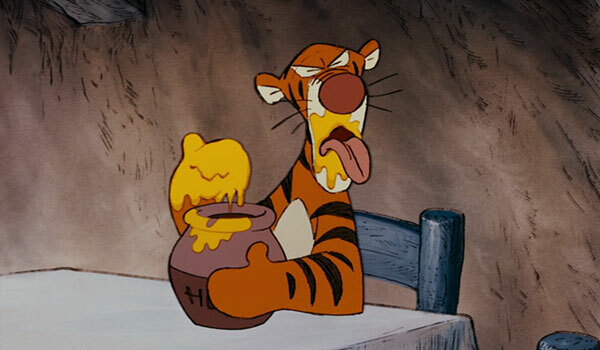 Still, his glee at wanting to reduce Tigger to nothing, basically, is going a bit too far in my mind. I’m an introvert too, and I’ve probably lashed out plenty of times when I reached my social interaction limit, but despite the bouncy happy ending, Rabbit doesn’t ever seem to really reach even keel about it. I do think it’s interesting that this group of “friends” is really quite disparate in terms of personality, and they don’t actually get along that well if you think about it. It’s the kind of group that gets thrown together when there aren’t very many people to choose friends from, so you have to learn to put up with each other instead of just forming cliques of people who are like you.